Leviton Hospital grade angled straight blade plug has rugged construction that resists impact, sunLight, chemicals and rough use. It has solid 1-piece brass material for better conductivity. The beveled back edges prevent body from catching on corners and rough surfaces. 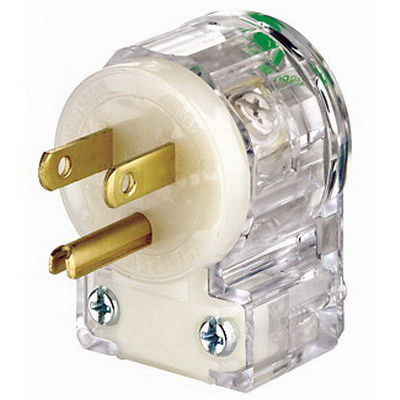 The blade plug comes with unique cord clamp that accepts a wide range of cord sizes, which provide a secure grip without damaging cord jacket. The blade plug meets UL File E13393, CSA File LR-406, NOM 057, ANSI C-73, NEMA WD-6, Fed Spec WC-596 standards.